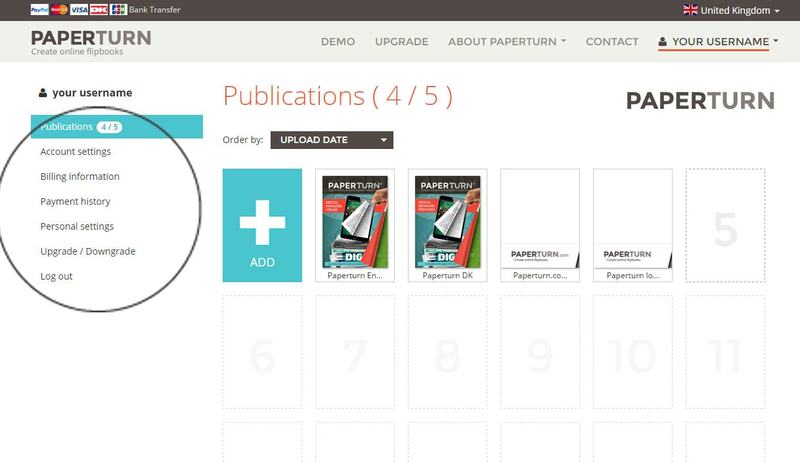 Paperturn is an application which helps you convert your PDF file into a nice flipbook. In order to create a flipbook, firstly you need to have a PDF file. After that you need to log in to your account at Paperturn. If you do not have an account you have to either go to the UPLOAD button in order to add your file and then complete the registration details in order to create an account, or click on LOGIN and then the SIGN UP button. The moment that you logged in you will have access to five submenus: Publications, Account settings, Personal settings, Upgrade/Downgrade and Log out. Regarding your publication, you can easily open it if you click on its cover and then the OPEN button. There you will see the exact PDF file that you uploaded but in flipbook form. 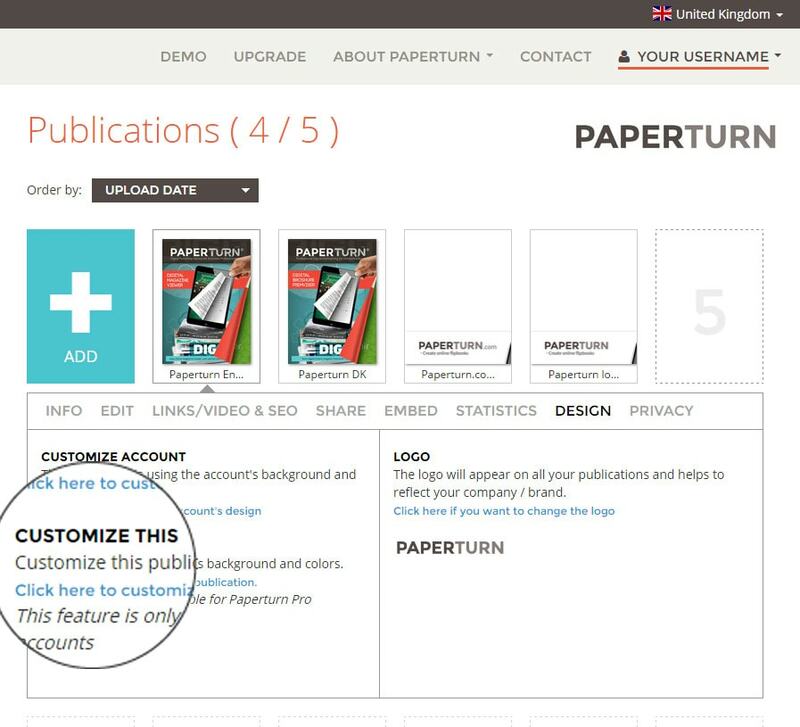 You can edit your PDF flipbook in many ways with Paperturn. For instance, you can add a title, change the SEO link, write a description or even add keywords for SEO purposes. Furthermore, you are able to change the date of publication, the language or the type of flipbook. Last but not least, you can switch whether the publication is available or not for others to view and you will also have the right to allow others to share or download your publication. Another important milestone in creating the flipbook is designing your publication. 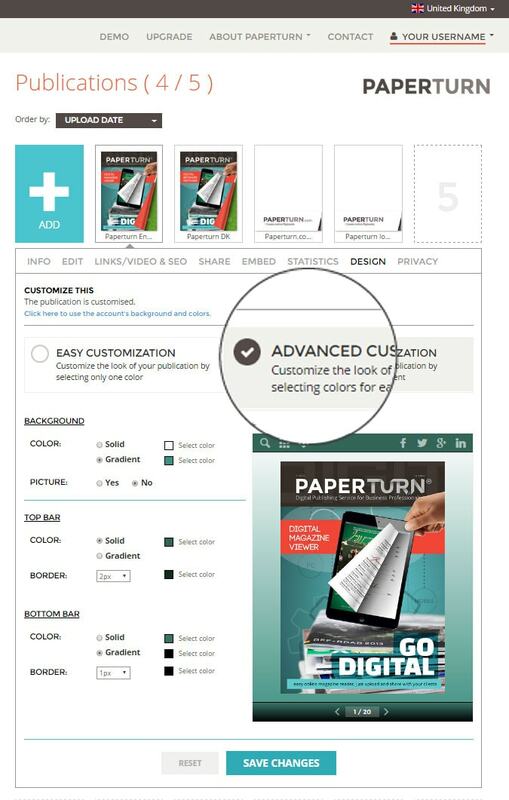 Primarily, you will have to choose how to customize your publication. There are two ways of personalisation of your PDF flipbook. The first one is Easy Customization, which allows you to use just a single color for the background and the second one is Advanced Customization where you are able to go in depth with each element and choose its color and border. Another feature is to set the publication's privacy. There you will choose whether to allow somebody to see your publication by logging in with a username and a password or not. The final feature is the link/video & SEO where you can add either links and videos, change the title of the page or edit the SEO so Google will be able to find your publication by description, keywords or other text. In this field you can also overwrite, move or delete a page. The last two milestones are for the PRO account which can be upgraded at the UPGRADE/DOWNGRADE field.